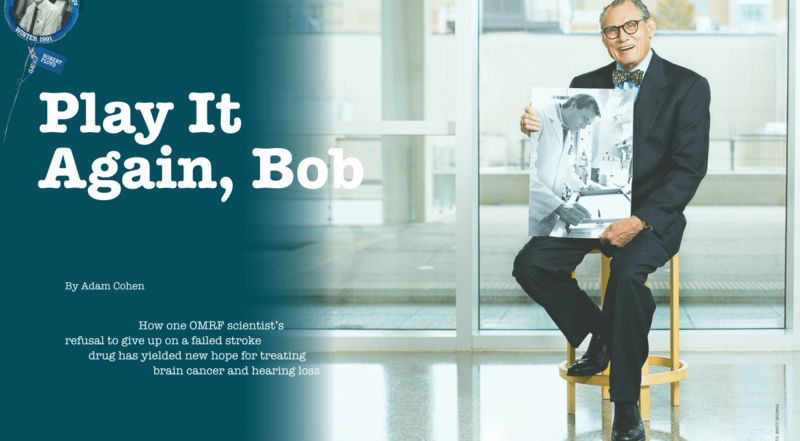 You see, the very first story on the very first page of the very first edition of this magazine told about an exciting discovery Floyd had made in his laboratory at OMRF. He had found a family of compounds that appeared to be effective in preventing some of the neurological damage caused by strokes, even administered after the stroke had already occurred. That major finding would lead to 15 years of development and testing of an experimental drug to treat people who’d suffered strokes. After giving the drug to nearly 5,000 patients, the company that had sponsored those trials abandoned them, concluding that the drug showed no meaningful benefits. Another decade’s worth of work now seems to have proven him right. Today, the compounds are undergoing a pair of clinical trials: one to treat hearing loss, the other in patients suffering from a deadly form of brain cancer. While these studies are still ongoing, each shows promise for meeting a crucial medical need. A happy ending is by no means guaranteed. But the fact that it’s even possible is a tribute not only to Floyd but also to a small band of people who shared his ability to recognize something that no one else could—hope. More than 25 years ago, Floyd made what would prove to be the most exciting finding of his scientific career. He found that a compound he’d been using to trap highly reactive oxygen molecules prevented brain injury in animals that had suffered certain types of strokes. What’s more, the compound worked when given up to an hour after a stroke. Floyd immediately saw that this discovery held enormous potential for treating stroke in humans. After a dozen years of pre-clinical research and development, a compound based on Floyd’s discovery entered human clinical trials. It successfully completed the first two phases of those trials, showing itself to be safe and, apparently, effective. In a larger phase III trial involving 1,700 patients, the drug showed efficacy in treating ischemic strokes, where a clot blocks the blood supply to the brain. But before the U.S. Food and Drug Administration would approve the drug for widespread use, the agency wanted more testing conducted to ensure that the drug posed no risk to patients who’d suffered hemorrhagic strokes caused by the rupture of weakened blood vessels. That additional testing involved 3,000 stroke patients on five different continents. The trials found that the drug posed no harm to people who’d suffered either type of stroke. But while the earlier, smaller trials had showed that the drug prevented the brain injury that triggers the loss of speech, mobility and vision that follows an ischemic stroke, the larger trial demonstrated no such beneficial effect. As a result, the company that had spent roughly $400 million to develop and test the drug decided to abandon it. In the wake of the failed trial, Floyd was “terribly depressed.” Eventually, he convinced himself to take another look at the reams of experimental data he’d generated over time. Could something, he wondered, be salvaged from more than 10 years of research? In the notebooks, he reviewed results of previous experiments. His earlier work showed the drug might hold potential to treat some forms of cancer. But when he tried variations of the drug to treat mice with liver cancer, the results were mixed. The compounds showed some promise, yet the results weren’t enough to convince him to move forward with further work. In experiment after experiment, the drug attacked the tumors, inflicting no perceptible damage to surrounding tissues or negative side effects to the rodents. Towner searched out more and more aggressive models of the cancer, and each time the treatment proved effective. Even months after therapy was stopped, the rodents showed no evidence of regrowth or recurrence. The tumors had disappeared completely. Drug development is a notoriously risky and expensive business. Success rates are low, and, even when an experimental drug proves effective, a relatively small research institute like OMRF lacks the resources to take a discovery all the way from the laboratory to the clinic. Nevertheless, the earlier failed clinical trials had some silver linings. The company that ran the studies had granted OMRF unfettered access to the results of those trials. The data, which showed no significant side effects when given to almost 5,000 patients, could form the basis of an application to the FDA, and that application could be prepared at a fraction of the cost normally required to put together such a proposal. What’s more, the company gave OMRF the drugs that still remained from the stroke trial. If the FDA approved the trial, OMRF could use those drugs to treat cancer patients. So OMRF made a decision: For the first time in its history, the foundation would sponsor its own clinical trial. OMRF raised $750,000, with a major portion coming from i2E, a non-profit focused on stimulating innovation in Oklahoma. These funds would be enough to pay for a small early-stage clinical trial. Foundation staff then prepared the Investigational New Drug application for the FDA. The agency maintains a 30-day window to review applications like OMRF’s. Regulators use the time to comb through the documents (in this case, more than 7,000 pages worth) and request additional information, if needed. If an applicant hears nothing from the agency, it may proceed with trials. With only minor modifications to the application, OMRF’s 30 days came and went. When Dr. James Battiste diagnoses a patient with glioblastoma, the neuro-oncologist doesn’t mince words. “I tell them that this will be the most trying time of their lives,” says Battiste, an assistant professor of neurology at the University of Oklahoma Health Sciences Center and a physician and surgeon at OU’s Charles and Peggy Stephenson Cancer Center. The typical course of treatment for this type of brain tumor involves surgery, a follow-up six-week course of radiation and chemotherapy and, in many, a second regimen of chemotherapy that can last as long as an additional year. The effects of the illness and treatments are often profound. “From the tumor, patients can experience memory loss, seizures, difficulty thinking, changes in personality, hallucination, vision loss, weakness and stroke-like symptoms,” says Battiste. Meanwhile, the radiation and chemotherapy can cause fatigue, nausea, hair loss and insomnia. Even with surgery, radiation and chemotherapy, the five-year survival rate for glioblastoma patients is less than 10 percent. So Battiste is constantly searching for new therapies. When he joined OU from the University of Texas Southwestern Medical Center in 2013, he began enrolling patients in the clinical trial for OKN-007 at Stephenson. Battiste is not alone in this belief. With the funding for the early-stage trial nearly exhausted, OMRF once again sought out a pharmaceutical partner to help move OKN- 007 forward. And though, as of press time, no deal had been signed, a suitor has emerged. OMRF Vice President of Technology Ventures Manu Nair, who’s led the negotiations, is optimistic about the drug’s future. Hope, it’s said, can grow in unexpected corners. And when it does, it sometimes sprouts in more than one place. As OKN-007 made its way through preclinical and clinical trials in glioblastoma patients, Floyd and another scientific collaborator began examining whether the compound might also have some effect in treating hearing loss. The answer, it seems, may be yes. Floyd had first looked at using a similar compound to treat hearing loss in the 1990s. That work had shown some slight effects, but the results weren’t dramatic enough to warrant further study. So he dropped the project. A decade or so later, Dr. Richard Kopke came to Floyd with an idea. During his 26 years as a physician in the U.S. Army, Kopke had treated countless soldiers who’d suffered hearing loss as a result of blasts from bombs or improvised explosive devices or by prolonged noise exposure caused by sources like jet engines and artillery fire. Following his service, Kopke had retired to join the staff of the Hough Ear Institute in Oklahoma City, where one of his research interests was finding ways to treat and prevent these types of hearing loss. Kopke had been working with a compound that showed marginal protection in these situations, but he thought he might be able to do better if he combined that treatment with Floyd’s compounds. The OMRF scientist was intrigued, so he provided Kopke with some OKN- 007. 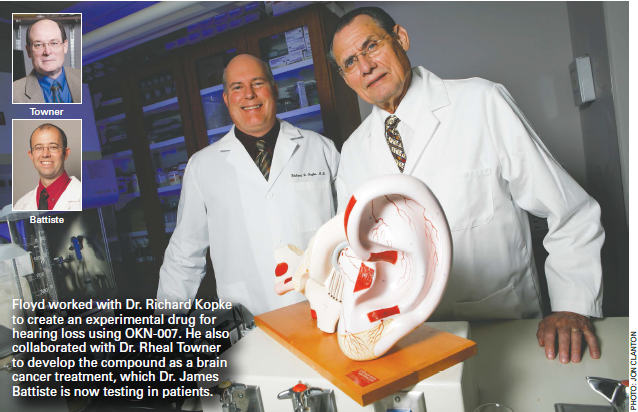 When Kopke administered the two drugs to rodents before exposing them to noise challenges, he found the combination reduced hearing loss. Even when given after the noise exposure, the drugs offered some protection to the tiny hairs in the inner ear that are crucial to hearing. Based on these preclinical results, OMRF and Hough formed a spin-off company, Otologic Pharmaceutics, to develop and test the drug combination. With support from local investors such as i2E and Accele BioPharma, an Oklahoma City biotechnology incubator, the company is now testing the drug combination for safety in humans. If those trials prove successful, the company plans to expand testing to study the drug’s effectiveness at preventing hearing loss in people. The new treatment could answer a critical unmet medical need, says Kopke. Floyd no longer runs a lab at OMRF. But he still comes to the office regularly, where he keeps tabs on the progress of OKN-007, both in its clinical trials and in ongoing research projects that Towner and Kopke are conducting. On occasion, he’ll offer some consultation on those projects. As his research career has wound down, he’s found a passion that, like his work on OKN-007, ties back to an earlier part of his life. As a child in Kentucky, he’d gather each night with his family around an old organ and sing. With science keeping him so busy, he never pursued his interest in music. But several years ago, he finally took the leap. Today, he sings each Sunday in the choir at All Souls Episcopal Church. After more than 25 years of working with OKN-007 and its sister compounds, he is ready for them to stand out, too. But does he ever wonder what it might have been like if he’d chosen research projects that didn’t have quite so much hope attached to them? Because, when a promising new drug for a life-threatening condition fails, there’s a real human price. People get sicker and die. So isn’t working in this field—where most experimental treatments end up falling short—just a recipe for heartbreak and frustration?